Centsible Savings: Freebies at Arby's every Wednesday throughout the summer- no coupon necessary! 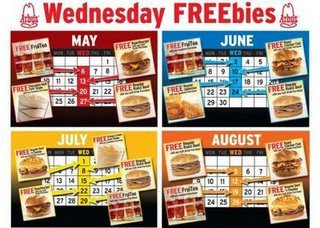 Freebies at Arby's every Wednesday throughout the summer- no coupon necessary! So I went to Arby's on Wednesday for my free FruiTea and saw signs everywhere for "Arby's Freebies Wednesday's" So I asked the cashier and she referred me to a large poster of a calendar on which was scheduled out all the free things they will be offering on Wednesday's for the whole summer. There is no coupon necessary for these deals as long as your local Arby's is participating. No more just "free" items, but most weeks are pretty good with a free sandwich with only the purchase of a drink. What a great deal! I will be spending some time at Arbys this summer! great deals, posting at my blog with thanks to you!! Thanks! I also linked to your post! Great find. Nice! I'll be posting this on my blog too. Wow. I got the email from Arby's, but I was looking for the complete summer schedule. I'm posting it in my blog with credit to you. Thanks from a fellow Atlantan. The Arby's in Alexandria, Va.near/on Little River Turnpike is NOT participating in the Freebie Wed. deals. They turned us away. They said we had to have a coupon and we could not find one anywhere. Thanks... Going to send to friends. It is a great deal but our Arbys in Cornelia Ga requires you to come in if you order more than 1 special. That is impossible with 5 kids, 2 of which are 2yo twins.